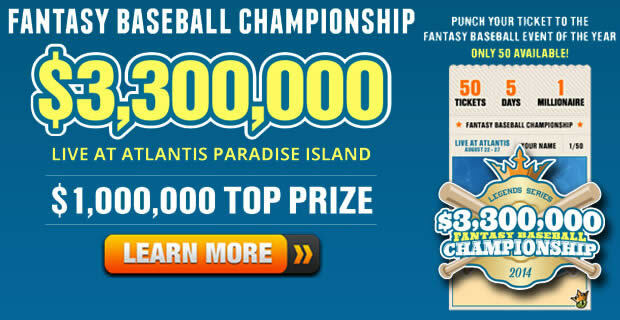 How Much Money Can Be Won Playing Fantasy Baseball Online? How Much Can I Win Playing Fantasy Baseball? Winning money is the goal of every user that plays fantasy baseball for cash. The chance to form a team, compete against others, and profit is what it's all about. But how much can users really win by playing fantasy baseball? Furthermore, what types of winnings are available to users outside of traditional cash prizes? For those interested in the prospect of playing fantasy baseball for money, check out what you can expect when signing up for play in a fantasy baseball league for real cash. There are several variables that play a role in determining the amount that is won playing fantasy baseball. The first is the type of league a user is in. There are daily fantasy baseball betting sites, and there are traditional leagues. Another variable to account for is the amount of money or prizes that is being played for. Typically, the more a user plays for, the more that can be won. But as you will find out below, there is one type of fantasy league where the ceiling is significantly higher. There are many different types of prizes that can be won that don't include money. In large part these prizes are unique to the website that runs the league. Users will be able to select a prize package prior to the formation of the league so that it is known ahead of time what is at stake. Popular examples of prizes include store credit to the website offering the league. ESPN is a good example of this. The ESPN shop online will offer prizes and credit for winners of leagues. Other prizes can include a combination of cash and assorted gifts. Outside of the standard traditional + daily leagues, websites might offer promotions that give away cash, prizes, or both. Baseball is a very popular fantasy sports and garners many users. Contests revolving around the Spring Training, the playoffs, and the World Series can be found. Daily Fantasy Baseball Sites - More Opportunities To Win Cash! In terms of money, daily fantasy baseball betting sites allow users the biggest potential profit. This is because there are more contests to enter, and there is no cap on what can be won. Daily sites take fantasy baseball and turn it into mini seasons. A traditional fantasy baseball league will last the length of the season, but when doing a daily league, it lasts just one day! To play, users simply select the contest they want, make their picks, watch the games + see the results calculated live. If that player finishes within whatever payout parameters were set for the particular contest, that player will be paid whatever cash is due according to the payscale. What's more is that users are not limited in the number of contests that they can join which thus creates an array of opportunites to wager each day! This leaves the door open for hundreds of contests to be played every day. Imagine someone with successful teams winning many tournaments in one day. That could be a big profit! What's the Bottom Line?... I'm Ready To Play!!! Daily fantasy baseball wagering sites are the places to visit if a user is trying to win cash. There are more contests and more chances to win money, period. The freedom that users have is very appealing, with any and all budgets accepted. The chance to turn a small budget into a large budget has never been more readily available for fantasy baseball than at the daily sites. Users do not have to wait the duration of the entire 162-game season to make a profit. They can profit each day, and try to turn that profit into more profit.